We all know about the craze of denim and wedges this summer. I am absolutely obsessed! Because I am pretty tall I do not usually like to wear super high heels during the day; I prefer to keep that look for some nighttime outings. However, with the come back of the wedge in medium height I am so happy because I can actually add that extra spark of elegance to my day look without needing to look too dressed up. This is how I would style my denim and wedges. This look is definitely a day time choice. 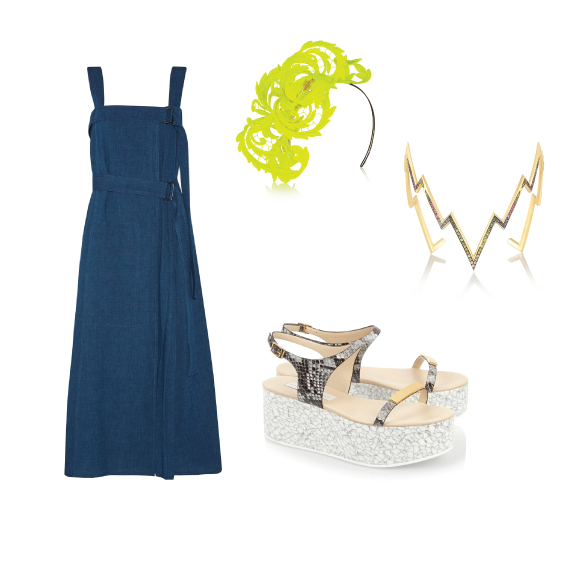 Although these Stella McCartney wedges can be worn at night due to their snake skin effect; I have chosen to pair them up with a casual daytime flowy denim dress. With a standout-ish headpiece and statement cuff, you can break a big of the monotony of the total look. When in doubt and feeling too plain, almost always try to focus on either one piece of statement jewellery or a combination of an oversized accessory and a flashy headpiece. One of my favourite trends this season has to be the cotton pants with denim effect. These are clearly for the day and even if dressed up I would not suggest you try to pull them off at night simply because of the casual looking material. With a simple look like this I would almost always settle for a pair of over sized statement jewellery to break from the simplicity and monotony of the look. 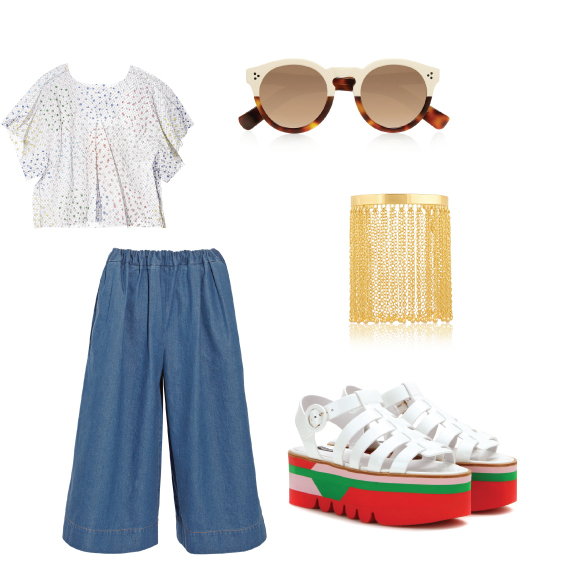 Perfect for a hot summer’s day; this look is your best bet for a casual lunch with friends. For a light vacation look I would definitely settle for this. The light weight loose denim culottes and loose fitted tulle top are the perfect choice for a summer daytime look. By keeping the outfit simple and subtle, you can always opt for a pair of flashy or standout-ish pair of wedges that speak for themselves. Because the shoes are already rather striking I would suggest you settle for simple accessories and a subtle choice for the rest of the outfit. This is a look that can be easily worn both day and night. Although denim skirts are usually associated with being rather casual. the crystal effect on this skirt allow it to look more formal and thus can easily be worn at night. To allow the skirt to speak for itself I would aim for a simple mono-colored top that will not jeopardise removing the attention of the statement skirt. To be worn at night I have paired this look with black wedges for a more classic look. Because the skirt is a statement piece I would recommend you keep everything simple and opt for a pop coloured bag for some added final touches.